My aunt did the “Welcome to Kimmy’s Shower” sign with the other side of our corn sign for the farm. Us Duffield’s always bring the farm where ever we go! As you all know, food part is always something I look forward to. Here is what I ate: avocado toast on whole grain toast, spinach and tomato omelette with potatoes, bacon, fruit, tried my mom’s brioche french toast, Sweet Eats Cake, and some rice dessert balls they have at the restaurant. Ok I ate a lot, but it was so worth it! The french toast got me excited about anything with syrup. Which is why I am taking my normal go-to breakfast of oatmeal and taking it to a new level: a pancake form with 100% maple syrup and fruit. It may not be as good as Positano Coast french toast, but it did hit the spot on this chilly Sunday morning and was nourishing at the same time. To me when flavor meets healthy food, I get excited since it is a win-win situation. In a medium bowl, mash banana. Heat skillet, spray with oil, and cook pancakes 3-4 minutes on each side, until golden. 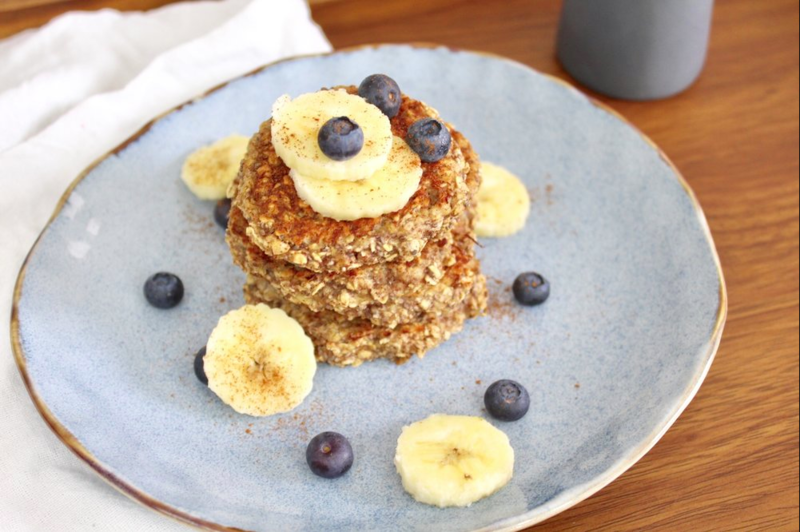 Enjoy with a drizzle of maple syrup, banana slices, and blueberries! I hope you all have a great rest of your weekend and great week to come! Remember each day we wake up is a blessing, live it with excitement and gratitude! If we throw the Sunday scaries aside and focus on what our purpose is in our job, to the people we communicate with, and whatever the week brings to us, you may actually be excited for the work week to come! We are all on this Earth for a reason and I encourage you to find your purpose. Once you have your purpose, you will be excited for each day and be a pleasant person. We may spend more time with the people we work with versus our family, so remember you can be a positive light and may prevent the Sunday scaries for other co-workers around you. Who wants to work with a grumpy person anyway? Life is too short for that! ©2019 Wellness Coaches. All rights reserved.